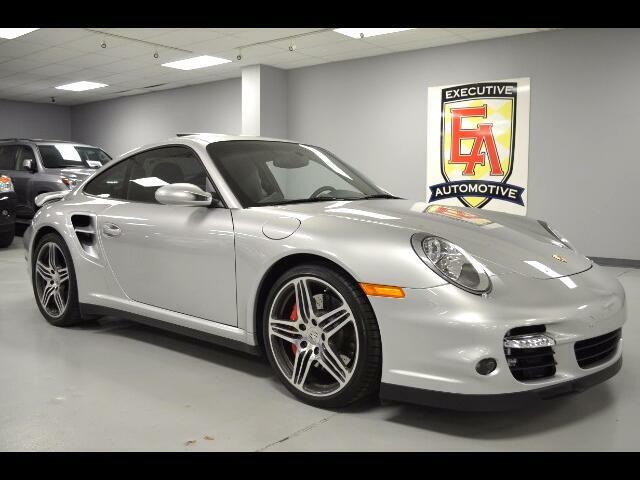 2007 Porsche 911 Turbo, Silver with Gray Leather, 9k Miles. Options Include: 6-SPEED MANUAL TRANSMISSION, NAVIGATION SYSTEM, POWER TILT/SLIDING MOON-ROOF, 19" ALLOYS, FOG LIGHTS, FRONT AND REAR SPOILER, MEMORY SEAT (driver), HEATED SEATS, CD PLAYER, CRUISE CONTROL, TILT STEERING, STEERING WHEEL AUDIO CONTROLS, POWER WINDOWS, POWER LOCKS, POWER MIRRORS, POWER SEATS (both), ENGINE TYPE: twin-turbocharged and intercooled DOHC 24-valve flat-6, aluminum block and heads, port fuel injection and more! Contact Kyle Porter at 816-616-2500 or email: kyle@executiveautomotive.com for additional information. Thanks for your interest in our 911 Turbo!